Stamford Mayor Martin, Stamford Police, Members of the Department of Justice and the FBI will be joining us for Iftar today (Friday, June 9th). As we need to keep the main parking lot available for our guests, we ask that you please park your vehicles at Laurel House or on Court St or in our vacant lot around the corner. 3) Friday, June 23, 2017 after after Goma prayer. Both fundraisers will go towards our mosques’ general operating costs, as well as replacement of the A/C, adding a fence around the Center, bathroom renovation and exterior painting. We are hoping to raise a minimum of $50,000, InshAllah. We urge everyone in our community to give generously. On behalf of the ICCNY Board of Trustees, I would like to thank you in advance for your continued and generous support! In the end, anti-Muslim vitriol itself undermines our security. Hateful and vicious rhetoric only strengthens the evil of terrorists who rely heavily on the narrative that America and the West hate Islam. We must rise above our anger to defeat the terrorists’ message of violence, intolerance, and hate. On the Fourth of July, we celebrated our nation’s independence, founded on the principle that all people are created equal and able to worship freely. For centuries, religious freedom has been a pillar of American society and a beacon for those persecuted for their faith. This year, July 5th marked the end of Ramadan, the month of intense prayer, dawn-to-dusk fasting and nightly feasts for millions of Muslims. The juxtaposition prompts reflection on anti-Muslim threats and violence we have witnessed in our country. Connecticut has not been immune to such shameful acts. On a night in November 2015, just hours after the terrorist attacks in Paris, a man used a high-powered rifle to shoot into the Baitul Aman Mosque in Meriden. Four shots pierced the mosque, one passed directly through the prayer area before exiting the building. No one was injured as the attack occurred late at night when no worshippers were inside. 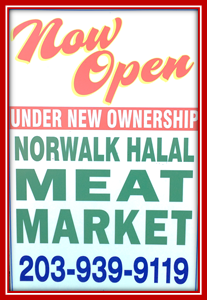 Law enforcement responded quickly, determined to restore a sense of security and calm to the Muslim congregation. Prosecutors from our office worked with the FBI, ATF and Meriden Police Department and quickly identified the shooter: Ted Hakey, a former Marine whose property abutted that of the mosque. After executing search warrants of his house and Facebook account, which revealed evidence of hatred toward Islam and Muslims, he was charged with the federal hate crime of destruction of religious property. On June 17, Mr. Hakey was sentenced to six months in prison for assaulting the mosque’s congregants in the peaceful practice of their religion. Mr. Hakey’s acts are not isolated. The Department of Justice has led more than 1,000 investigations and 45 prosecutions of anti-Muslim acts of hatred and bigotry. After the Paris attacks, an individual in Florida was arrested for threatening to firebomb two mosques in the St. Petersburg area, and sentenced to a year and a day in prison. In Utah, a man pleaded guilty to tearing a Muslim woman’s hijab off of her head on a plane. This intolerance is fueled by rhetoric that incorrectly seeks to paint all Muslims with a broad brush when, in fact, the overwhelming majority of Muslims, including prominent Muslim leaders in Connecticut, condemn and stand against acts of terrorism that harm innocent people. A remarkable thing happened in the Hakey prosecution. Mr. Hakey sought and received forgiveness from the congregation at the Baitul Aman Mosque. We applaud the congregation for their extraordinary grace and generosity of spirit, a gesture reflective of true Islam as the promotion of peace and harmony in the world. Last month, we honored the mosque’s leader at our annual law enforcement awards ceremony. More broadly, we deeply appreciate the dedicated efforts of our Muslim partners throughout the state to keep our communities safe and secure. As the federal prosecuting office in Connecticut, it is the job of the U.S. Attorney’s Office to secure and protect citizens of all races, religions, ethnic backgrounds and sexual orientations. Our federal prosecutors have forged partnerships with Muslim leaders throughout the state, as well as with Sikh leaders who are often perceived to be Muslim, to help ensure the safety of all our communities and create an environment of trust that recognizes the humanity and dignity of all. We have trained hundreds of police officers about Islam and Sikhism; held anti-bullying workshops at schools and mosques; and launched a Multi-Cultural Advisory Council to gain insight from community members about how best we can serve all communities that we protect. In the end, anti-Muslim vitriol itself undermines our security. Hateful and vicious rhetoric only strengthens the evil of terrorists who rely heavily on the narrative that America and the West hate Islam. We must rise above our anger to defeat the terrorists’ message of violence, intolerance and hate. To the vast majority of our Connecticut residents who recognize that our diversity as a nation makes us stronger, make your voices heard: let the Muslim members of our community know that they are a valued part of our whole. It is the responsibility of all of us to lift up the voices of tolerance, respect and mutual understanding. We all must pledge to remove hatred and intolerance from our midst, and to stay true to the principles of liberty, justice and equality that define America at its best. The light of our nation shines brightest when its people reflect the promise and values of America. Deirdre Daly is the U.S. attorney for Connecticut. It is with very deep sorrow and regret that I must inform you of the passing of our dear friend and brother, Dr. Ahmed Morad today in Patterson, NJ. Dr. Morad was one of the original Founders of ICCNY and part of a small group of very dedicated men, including his lifelong best friend, Brother Abdellatif Zureiqi, who fought tirelessly for decades to save and protect our mosque and was instrumental in making our Islamic Center what it is today. We will always be grateful to Dr. Morad and remember him for his continued hard work, good deeds and dedication to the ICCNY. He always stood for what was right. May Allah Bless and Reward Dr. Morad for his good deeds, for we would not have our wonderful mosque without his hard work. May Allah forgive his sins, Grant Dr. Morad mercy and admit him into the highest level of Paradise. May Allah grant all of Dr. Morad’s beloved family and his close friends patience to help them through this extremely difficult time. Dr. Morad’s burial will be tomorrow morning, 11am, at the Kensico Cemetery, 273 Lakeview Avenue, Valhalla, NY 10595. 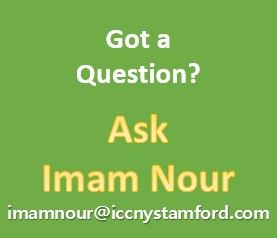 Prayers and condolences may be offered to Dr. Morad’s family and close friends tomorrow at the ICCNY, 1558 Washington Blvd, Stamford, CT 06902 from 5:00p to 9:00p. I happy to announce that tomorrow marks the first day of Ramadan 2016! Taraweah will start tonight after isha’a prayer at the mosque. Joining us for our first iftar dinner tomorrow at the ICCNY will be our friends from the U.S. Federal Justice Department including the United States District Attorney, Special Agents from the FBI and Homeland Security, both the Stamford Chief and Captain of Police and the Christian and Jewish representatives from the local Interfaith Council. We also invited our Congressman Jim Himes and Senator Richard Blumenthal. Parking: The parking lot will be reserved for our Special Guests and their Security Forces only. Please park in the Laurel House parking lot or in our vacant lot on West Washington. 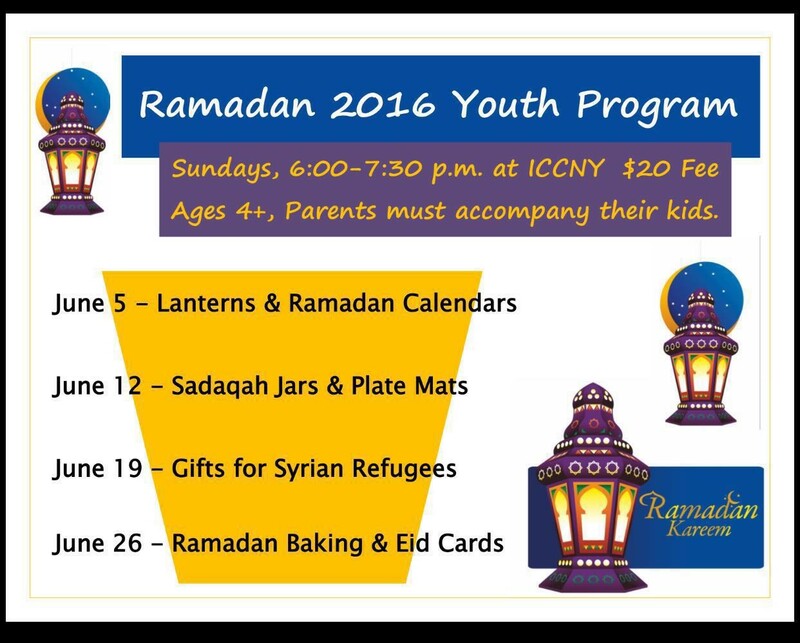 Please join us at the ICCNY tomorrow 5/27 night for a special presentation between 8:30-9:30 pm on how to prepare for Ramadan nutritionally. Nutritionist Aadil Ansari will advise us on what to eat during Ramadan so we can maintain good and consistent energy. Also, please note that our 2016 Ramadan Iftar calendar is now up and running on the website. Anyone wishing to sponsor an Iftar meal may do so by signing up directly on our website. Thank you. Happy Ramadan to Everyone! May Allah bless our Fasting. Please join us at the ICCNY (2nd floor) this Sunday, December 20, 2015 at 12:00pm for a short program in honor of our beloved Prophet Mohamed’s (PBUH) Birthday. The program will consist of our Sunday School children who will perform a brief recital of songs they learned in class. We are also very pleased to have a special visit from our Congressman Jim Himes, Stamford Mayor David Martin, Stamford Deputy of Police, Stamford Captain of Police and a Representative from Homeland Security. They will be discussing perceived Islamophobia and the overall safety concerns we have within our Community.